Saving money is often among people’s New Year’s resolutions. When it comes to plate lunches, it’s also important to get the most bang for your buck. I didn’t realize until I compiled this list that almost all my favs start off with chicken, but don’t think that’s too girly: It turns out that chicken plates are the top sellers at a lot of plate lunch spots. So whether you’re trying to lower your lunch budget or simply looking for great deals, check out my Her Top 5: Cheap plate lunches. Most plate lunches at Joe’s cost just $6.75, and you can mix and match different entrees for $1 more. Steak with mushrooms and onions ($8) and the roast pork plate ($7.25) reign as the top-selling plate lunches, and the Joe Moco Special is right up there with them. 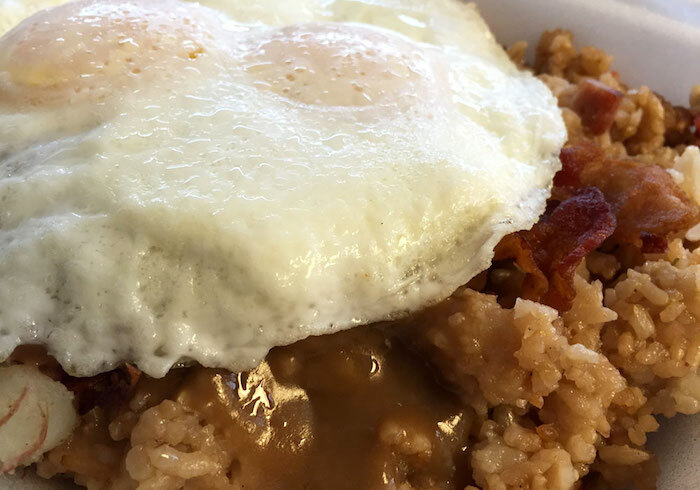 It features corn beef hash patties, two pieces of bacon, two eggs, three scoops of fried rice and gravy all over. Pros: That corn beef hash is unreal. It’s moist and savory but not overly salty. Pairing it with oozing egg yolks, crispy bacon and fried rice makes each bite an explosion of flavor. Cons: I can finish this in one sitting if I’m really hungry (plate lunch fiend or not, I still try to watch my carbs). If you’re starving, I would suggest going for one of the heftier $6.75 plate lunch options. $7.50 goes a long way at Waiakamilo Drive Inn. The majority of plate lunches here cost this much, including favorites like the BBQ chicken and mochiko chicken. Plate lunches consist of a plentiful portion of meat with creamy, flavorful mac salad that’s not overflowing with mayo and two heaping scoops of white rice. My pick, garlic chicken, is the most popular of Waiakamilo’s chicken choices. It’s crunchy and garlicky enough, with minimal fat and grease. My family complains that I still reek of garlic two days later, but I relish each bite. 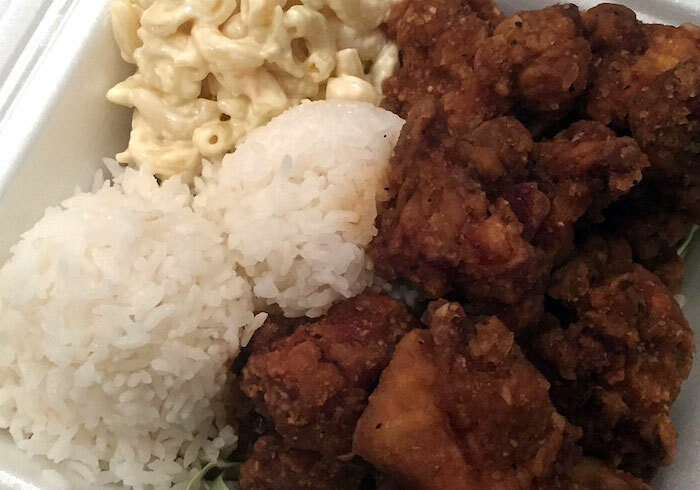 Tip: If you want a sampler, go for one of the bentos. Think Zip Pac but cheaper ($8.25) and with more meat: You get katsu, teriyaki steak, mahi and Spam. Broke da mout’ without breaking the bank. 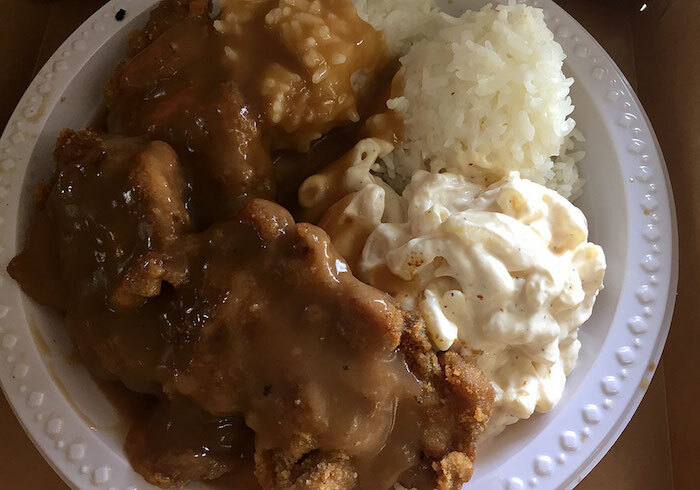 The is my go-to plate every time I go somewhere over the Rainbow: boneless chicken with gravy, white rice, mac salad, to go. It’s one of the cheaper menu items, but even the top-selling mix plate costs less than $9. Whether you dine in or take out, Rainbow’s always delivers on portions and price. I can never finish all the rice, and I try to save half of the chicken for another meal. It’s hard to stop, though, once you pop that first piece of flavorful, tender, gravy-slathered chicken in your mouth. Yup, you read that right. Not L&L … it’s L&R Drive Inn. This Kaneohe gem is located right off Kam Highway, and you’re sure to make the most of your moolah at this hole-in-the-wall. Chicken katsu is L&R’s most popular entrée, and I love katsu. My Styrofoam takeout container cracks under the sheer weight of the glorious, 2.5-slab chicken katsu spread inside. 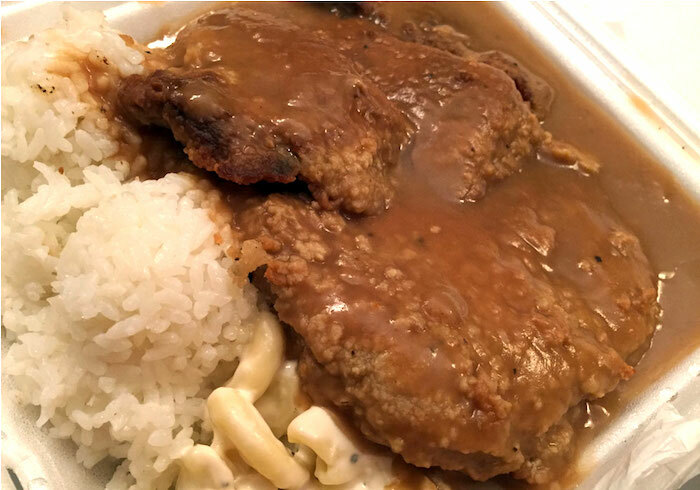 This katsu mirrors L&L’s, delivering that same golden, crispy exterior and succulent interior. 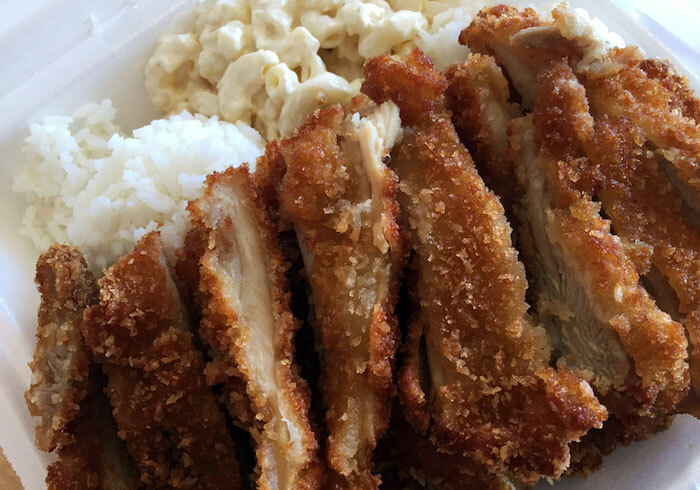 L&L’s regular chicken katsu plate costs $9.45, and you get close to the same amount at L&R. Just sayin’. It’s been said that Richie’s rivals Rainbow’s when it comes to that famous boneless chicken. And this is Richie’s best-seller. Under the pool of gravy are two giant slabs of chicken. The two scoops of rice are smaller than most, but the massive pieces of chicken compensate. Plus there’s even more mac salad under the chicken. The chicken is juicy and the mac salad is creamy and good, but it’s the gravy that has me eating nonstop until I wonder where the entire meal went. Best $6.99 ($7.32 with tax) that I ever spent on a plate lunch. Ready for a guy’s point of view? Here’s His Top 5: Cheap plate lunches.